This training shoe from Capezio is especially designed and made for dancing and for all sorts of aerobic exercising, which makes it a perfect choice for Zumba classes. The upper is made from a combination of imitation suede and PU Nubuck as well as light and breathable nylex mesh. It has vents and a perforated arch for even better ventilation and breathability, to keep your feet dry, nice and fresh even after an hour of dancing or training. The EVA footbed is cushioned, contoured and removable. The shoe’s toe is flat – made specifically for toe stands. The tongue, as well as the collar and the Achilles notch are padded for a snugger and more cushioned fit. The nice tight fit is further enhanced by the especially spaced speed loop lacing system. The split sole helps improve flexibility and articulation of the foot during exercise and dancing. The outsole features patented flex points as well as a unique spin spot on the forefront. These shoes are great for dancing and gliding on a carpet and indoor field as they will keep the feet and knees stable. They could be a little slippery on a wooden floor though, plus without sufficient shock-absorption to keep the feet from getting sore and tired, so if your Zumba class is in a studio on a hard floor you should be careful with these shoes. 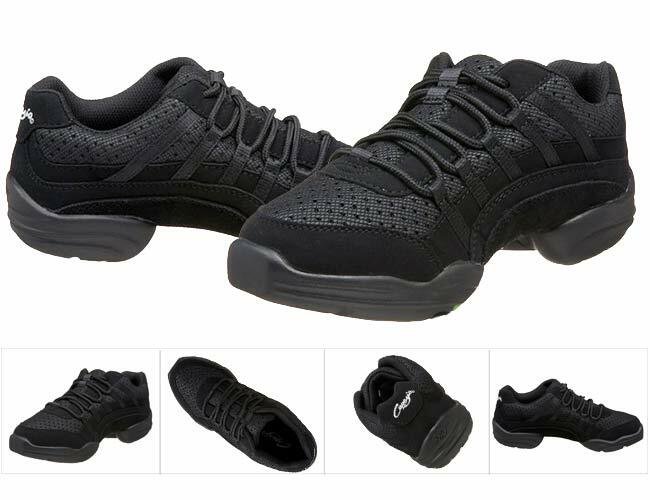 Overall, these shoes are light, breathable, provide a nice snug fit and sufficient support for the feet. The especially designed split sole helps improve the flexibility, and provides easy gliding when doing Zumba or dancing on a carpet. We can definitely recommend these shoes for ladies who are looking specifically for shoes for Zumba. The flat toe, padded Achilles notch and unique lacing system as additional perks for ladies who want to enhance their performance in Zumba class and at the same time feel comfortable and safe while at it.